JAKARTA (26 August 2018) – Indonesia’s Anthony Sinisuka Ginting continued his sensational run in the Asian Games men’s singles competition with yet another dazzling display in the quarterfinals, this time against fifth seeded Chen Long, today. Anthony, who sent second seed Kento Momota crashing out yesterday, won 21-19, 21-10 to advance to the semi-finals. 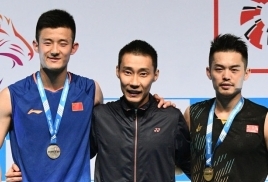 Earlier, Anthony’s teammate, Jonatan Christie made it a double celebration for the hosts when he worked his way past Vincent Wong Wing Ki to also make it to the last four. Ranked seventh, Anthony, who had a 3-2 head-to-head record against Chen Long prior to today’s game, will face Chinese Taipei’s Chou Tien Chen, the fourth seed here, in the semi-finals tomorrow. Chou had beaten Angus Ng Ka Long Angus from Hong Kong 21-18, 21-18 in another quarterfinal tie. Anthony said the support from the fans had contributed to his performance. “The fans have been amazing and have showed fantastic support to the team. 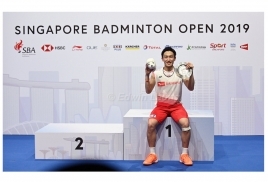 I want to thank them, those in the stadium and at home, and I hope to the celebrations will continue,” said the 21-year-old Anthony who added that Chen Long was stronger initially but made more mistakes in the second. In the second game, Anthony led 11-6 and steadily pulled away to lead 17-7. Anthony kept his cool and went on to seal the win and guarantee himself at least a bronze. Jonatan, ranked 15th, quickly wrapped up the first game 21-11 but Vincent turned up the heat after that and chased his rival down. They were tied at 12-all and later 18, then Jonatan made a final push and came away the winner at 21-18. He will meet the victor of the Sin Wan Ho vs Ken Nishimoto match later today. Anthony and Jonatan are at different halves of the draw and if they both win tomorrow, the fans could be treated to an all-Indonesia final. In the men’s doubles, second seeded Chinese pair, Li Junhui-Liu Yuchen faced little opposition from their Sri Lankan rivals, Sachin Dias-Buwaneka Goonethilleka to book their place in the quarters after securing a 21-12, 21-16 win. Indonesia’s Fajar Alfian-Muhammad Rian Ardianto swept past Malaysia’s Ong Yew Sin-Teo Ee Yi 21-17, 21-13 to advance to the semi-finals. In the women’s singles, world No. 1 Tai Tzu Ying put up a solid performance against former world champ Nozomi Okuhara of Japan in the quarterfinals today. Tzu Ying won 21-15, 21-10 to claim her place in the semi-finals. The manner in which Tzu Ying won today should worry all her rivals for she looks a strong bet for the title. India’s Saina Nehwal meanwhile upset fourth seed, Ratchanok Inthanon of Thailand 21-18, 21-16 to make her way into the semi-finals where she faces a tough battle against Tzu Ying.